We know everyone deals with the loss of a child differently. Sometimes, when the grief is raw, it can be a victory to get just to get out of bed each day. At Heartfelt, we like the idea of parents turning to exercise as they begin restore themselves physically and emotionally to help them come to terms with their loss. 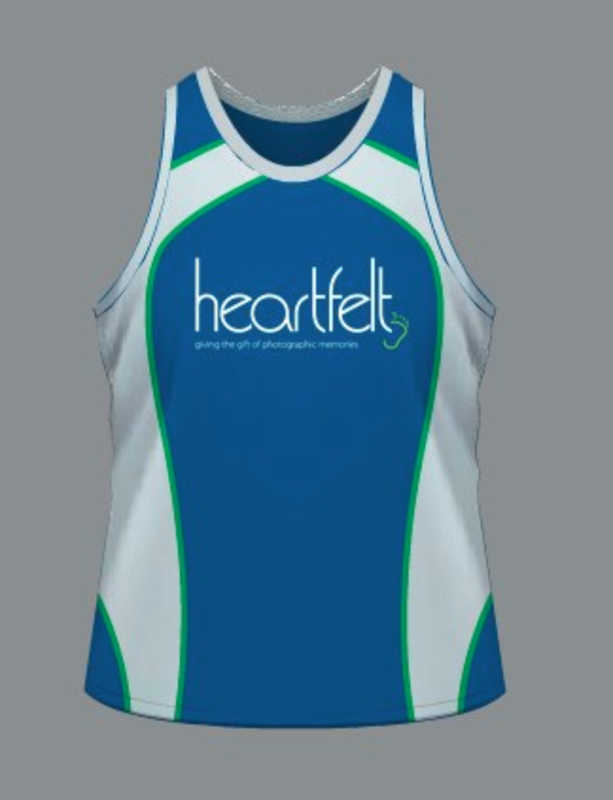 We would like to support parents on this path, by offering Heartfelt running tops with the option of having your child's name and date subtly displayed (on the sleeve for shirts and hip for singlets). We also like the idea of family and friends joining parents to support them on their health and fitness journeys, knowing their discomfort is nothing compared to the loss of a child. 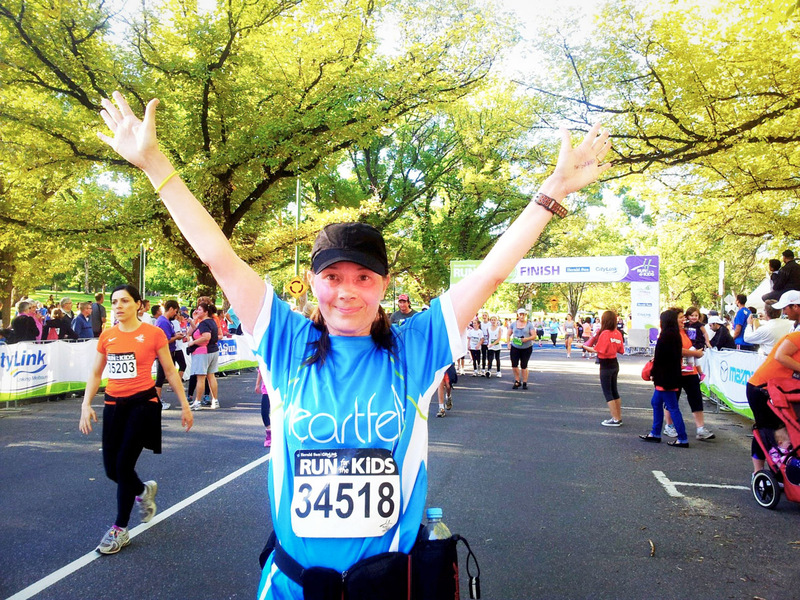 If you get a team together (of at least three people), choose a fun run/walk/activity and we can print customised tops for you at the subsidised cost of $30. All we need is four weeks notice. We are very keen to support people organising groups in a variety of different exercise and fitness endeavours across the country. From since I can remember, photos have been a big part of my life. In my family I was always the one to take photos. I now have a huge collection which includes all the photos from my parent’s home. One of my biggest fears is losing them all & I drive my husband nuts about it. We are always having to back up our PC & I hide my Ipad & camera whenever I am not home. I guess what I am trying to say is that I know how much photos can mean to someone. Especially photos of a loved one that is no longer with us. Over the past 5 years I have lost my mum, my girlfriend & her mum, a close family friend, an uncle, my brother, my dad's best friend & only friend (besides his lawn bowls mates), my dad's fiancé, 2 babies last year one of them being baby Lucy and about 5 other loved ones. I have photo’s to treasure of all of these people & I love sharing them with others because I believe that these photos would mean as much to them as they do to me. I have known about Heartfelt for about 6 months now and I never thought I would have to use your services – no one ever does. What you do is provide the best gift ever of a loved one and a lifetime of treasured memories. That truly is the best support you could give to someone. I wish I could think of the perfect words for you to know how thankful I am to have the photos of our baby Lucy Talitha by Heartfelt. Up until today I had only seen a selected few photos of her and she looked perfect. I waited until today to look at all of them photographed by Helen Roberts because today is Lucy's due date. I am absolutely amazed at how talented Helen is to be able to capture the perfect photos of Lucy for us to treasure at such a difficult time. If it wasn't for Heartfelt I wouldn't have beautiful memories of our baby Lucy that you provided for us. These help me feel closer to her and there for help with me the grieving process. Not that long ago I had no motivation. Everyday had been a struggle. I went to 2 different doctors to confirm to me that I was ok and did not have a terminal illness. I just didn’t have any energy to function as a mother, wife, family member and friend. This feeling made me feel ‘no good and completely useless’. I was becoming desperate to change my thoughts and ways of living so that I could become a better person in all aspects of life. I had to, especially for my husband and two girls, Maddy (4yo) and Georgia (2yo). I knew I needed to find a way to overcome what I call ‘Grief Overload’. 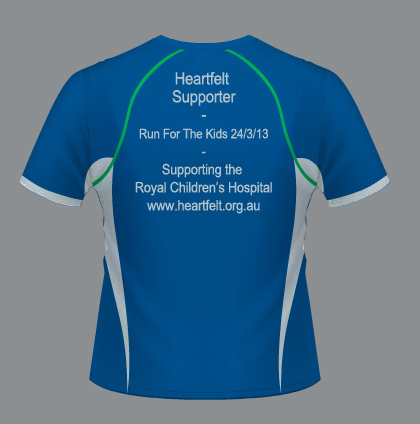 In February I noticed on your Facebook page an opportunity to run with Heartfelt in "Run for the Kids'. As soon as I read the words ‘You are able to customize your shirt if you wish with the name and date of a child's name to wear on your shirt sleeve or singlet side’, I was then determined to participate. I wanted be able to be a part of the Heartfelt Team, fundraise money for Heartfelt (as I’d never be able to thank them enough) and do all this in memory of our baby Lucy. This is what got me running, running and running and encouraged me to become fit & healthy & more positive than ever before. Your idea really has helped me mentally & physically and if it wasn’t for this fabulous idea of yours the grieving process would be more difficult for me to get through. I loved reading your page on 'Let us run with you'. What you said 'We like the idea of parents turning to exercise as they begin restore themselves physically and emotionally to help them come to terms with their loss' - IS SO TRUE!. If only there was a way to approach every grieving parent this idea to help them the way it has helped me. “Let us run with you’ is a brilliant way to encourage others to heal & bring teams together to support one another and start up a health and fitness journey. I believe this is what every grieving parent needs to do. Emma finishing the "Run for the Kids"
Emma said "An awesome moment for me. The best day I've had since we lost our baby Lucy." 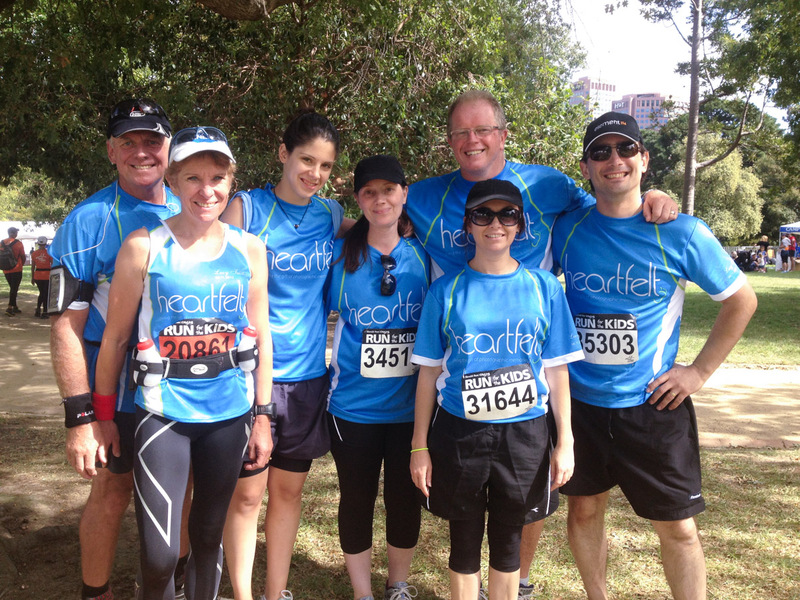 From now on I too will do what Heartfelt has done for me – encourage the ‘Let us run with you’ idea because I know how much this has helped me and I will continue to forever support Heartfelt as best I can. Heartfelt does amazing work. Thank you for EVERYTHING. 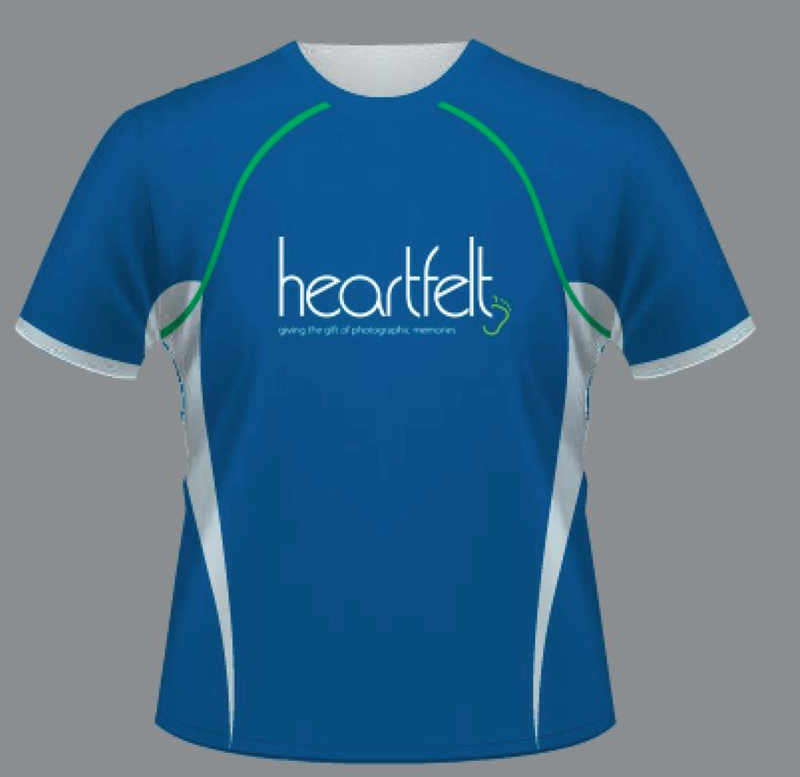 To organise your tops, email Gavin Blue at president@heartfelt.org.au and we will setup the order page for you.